The event was instituted in 1962, when the 1st World Pairs Championship took place in Cannes, France. Pierre Jais and Roger Trézel of France were the first champions. The World Bridge Series takes place in even-numbered years other than leap years, that is, 1990, 1994 and so on. These Championships are now the biggest of all WBF Championships in terms of entries. 1. Mikael Rimstedt – Ola Rimstedt (Sweden). 2. Joe Grue – Brad Moss (USA). 1. Ehud Friedlander, Inon Liran (Israel). 2. Jacek Kalita, Michal Nowosadzki (Poland). 3. Thomas Bessis, Cedric Lorenzini (France). 256 Pairs entered for the Open Pairs Championship. 1. Robert (Bobby) Levin – Steve Weinstein. 2. Bjorn Fallenius – Peter Fredin. 3. Josef Piekarek – Alexander Smirnov. The Generali Open Pairs had an entry of 246 pairs, and the medallists were. 1. 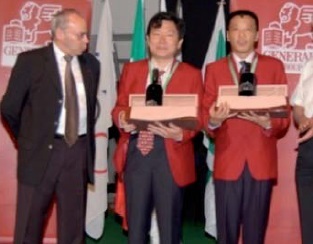 Zhao Jie & Fu Zhong. 2. Robert Levin & Steve Weinstein. 3. Fulvio Fantoni & Claudio Nunes. 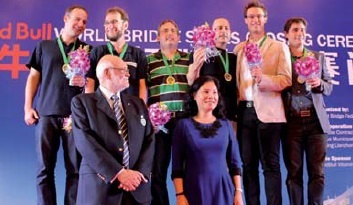 For the first time, all events at the World Bridge Championships were transnational. A special dedicated stamp was issued by the Italian Postal Service on the occasion of the event. Verona, with its monuments, history and tradition hosted a superb event. Magnificent was the Opening Ceremony at Gran Guardia Palace and memorable the Aida, directed by Franco Zeffirelli at l’Arena. 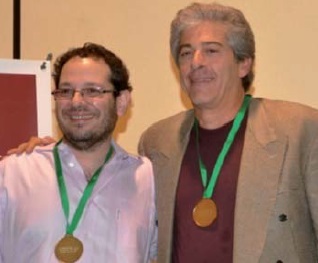 The Championship has been attended by several notable people such as Bill Gates, Edma Castro, Antoine Bernheim. The players really enjoyed their stay. The Open Pairs attracted a starting field of 336 pairs. 72 pairs from the qualifying event and dropins from the late stages of the Rosenblum teams played the five-session barometer final. 1. Fulvio Fantoni – Claudio Nunes (Italy). 2. Zia Mahmood – Michael Rosenberg (USA). 3. Diego Brenner – Gabriel Chagas (Brazil). The 2002 Championships were held in Montreal (Canada) where entries were considerably lower than on the previous occasion in Lille. The Open Pairs drew 328 entries. 1. Michal/ Kwiecien – Jacek Pszczola (Poland). 2. Larry Cohen – David Berkowitz (USA). 3. Magnus Lindkvist – Peter Fredin (Sweden). The 1998 Championships were held in Lille, France, and the many different events produced a record attendance. The Société Générale Open Pairs drew a massive 628 entries, with the same format as the Women’s Pairs. 1. Marcin Lesniewski – Marek Szymanowski (Poland). 2. Bob Hamman – Michael Rosenberg (USA). 3. Eric Kirchhoff – Anton Maas (The Netherlands). 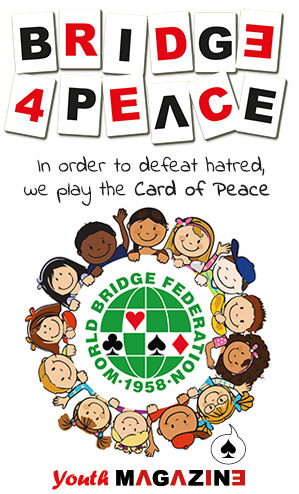 The 1994 NEC World Bridge Championships were held in Albuquerque (USA). The NEC Open Pairs drew 396 entries, and had the same format as the Women’s Pairs. 1. Marcelo Branco – Gabriel Chagas (Brazil). 2. Peter Nagy – Ralph Katz (USA). 3. Cezary Balicki – Adam Zmudzinski (Poland). This marked the first championship to be organised entirely by the WBF under the leadership of José Damiani, while Jaime Ortiz-Patiño, President Emeritus, guaranteed the financial viability of the event. 538 pairs started out on the long road to the Labatt’s World Open Pairs Championships. After four qualifying and four semifinal sessions, the field reduced to a 72-pair final played over five sessions. 1. Jeff Meckstroth – Eric Rodwell (USA). 2. Heinrich Berger – Wolfgang Meinl (Austria). 3. Stephen Burgess – Paul Marston (Australia). The Championships were restructured taking on an intricate, yet at the same time, more unified form and saw the first use of the name “World Bridge Championships” to describe the four-year cycle of WBF events. Bal Harbour also marked the first step in opening up these contests by enabling a wider group to earn places in main events by entering a preliminary stage. To provide stronger continuity, the various stages of the events were linked more closely by extending the repechage principle. Another new feature provided additional linkage: high achievement in one event could confer exemption from a preliminary stage of the next. In the World Pairs, a limited number of entrants from each nation were able to enter a qualifying round while the regular quota entered the mainstream. Qualifiers were joined progressively by eliminated mainstream pairs. Both streams played the same boards. For the first time, a continuing repechage offered unsuccessful pairs the prospect of climbing back into contention. After 13 sessions of play, not counting the qualifying rounds, a record-breaking field was led home by an American pair whose margin of nearly six boards set another record. 1. Chip Martel – Lew Stansby (USA). 2. Anton Maas – Max Rebattu (The Netherlands). 3. Gabriel Chagas – Roberto de Mello (Brazil). In the World Open Pairs, from a record field in the four-session qualifying round, 224 pairs entered a three-session semi-final that reduced the number to 40 for a four-session final. 1. Marcelo Branco – Gabino Cintra (Brazil). 2. Eric Kokish – Peter Nagy (Canada). 3. Roger Bates – John Mohan (USA). 1. Bob Hamman – Bobby Wolff (USA). 2. Adriano Abate – Leandro Burgay (Italy). 3. Federico de Paula – Italo Zanasi (Italy). The Open was contested by 192 pairs. Europe’s hold on the Open crown was broken by Bob Hamman and Bobby Wolff for many years were in the top five ranked players in the world based on WBF master points won. Even today Bob Hamman has more Placing Points than any other player. These championships were held in Las Palmas, Canary Islands with 40 nations participating. 1. Fritz Babsch – Peter Manhardt (Austria). 2. Benito Garozzo – Federico Mayer (Italy). 3. William Saulino – Italo Zanasi (Italy). The championships were played consecutively with the Bermuda Bowl in Stockholm. Appropriately – for their country of origin was Sweden – bidding boxes made their first appearance in world championship play. Scoring across the field was used. 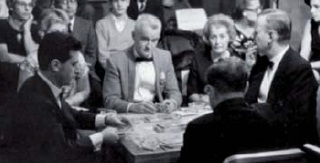 Computers enabled frequencies to be flashed onto a large screen visible to all the players well before the next round was finished. The ranking followed only a few minutes later. The Open was attended by 158 pairs. 1. Hans Kreijhns – Cornelius Slavenburg (The Netherlands). 2. Dr John Fisher – Jim Jacoby (USA). 3. B. Jay Becker – Dorothy Hayden (USA). The Championships, held in Amsterdam, were contested by 29 nations. The Open was attended by 106 pairs. The bronze medal earned by Dorothy Hayden (then Truscott) remains comfortably the highest ranking ever achieved by a woman in the Open Pairs. The Charles Solomon Trophy for the best overall performance by representatives of one nation was awarded for the first time at this tournament. It was won easily by the USA, and has been in the possession of the United States ever since. 1. Pierre Jaïs – Roger Trézel (France). 2. Terence Reese – Boris Shapiro (Great Britain). 3. René Bacherich – Pierre Ghestem (France). 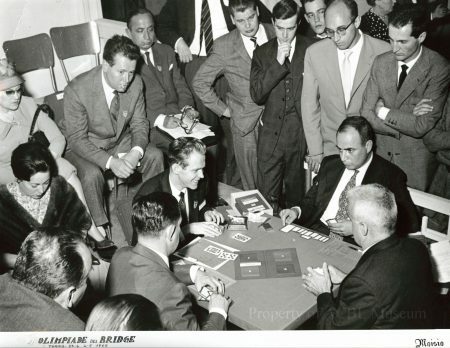 The first official World Pairs Championship was held in Cannes, largely at the initiative of Baron de Nexon, who was President of the French Bridge Federation, the European Bridge League and the WBF. The Open was contested by 78 pairs, representing 20 nations. Computer-scoring was used for the first time in an official international event.